My snail mail exchange with Britain's Queen Elizabeth II. Not emails; not Facebook posts; not tweets. You know, paper-and-envelope, stamped letters—the kind you can unfold and hold in your hand or slip into your breast pocket to read later. Conversely, I also receive letters. Most are from friends—and, occasionally, a foe. In the past, I've received letters from the White House, a Nobel Prize laureate, the Vatican and publisher of The New York Times. In my mail the other day was an ivory-colored envelope. "Royal Mail," one blue postmark read. Another was simply the letters "ER," in red, surmounted by a crown. It was from Her Majesty the Queen. Or actually, from Mary Morrison, one of her ladies-in-waiting. "My late Mama would never forgive me if I didn't—finally—express my admiration and feeling of genuine affection for you. You have reigned with uncommon dignity and grace." And, I believe, she has. The message from Buckingham Palace was typewritten, but the date, my name and the complimentary close were handwritten by the 80-year-old Morrison. 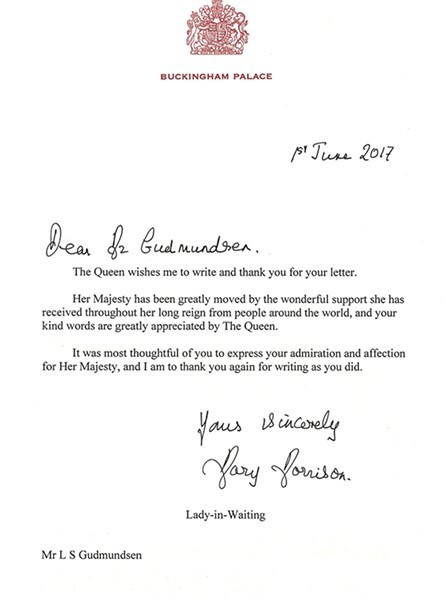 "The Queen wishes me to write and thank you," she wrote. "Your kind words were greatly appreciated." I don't harbor the notion that Queen Elizabeth actually read my letter. I'm certain she receives hundreds a day. For a woman of 91, she keeps a breakneck schedule. One of my all-time favorite movies is 2006's The Queen, starring Helen Mirren, who won a best-actress Oscar for her performance. It centers on the queen's response—or lack thereof—to the August 1997 death of Princess Diana in a Paris car crash. Initially, the queen's reaction was to do nothing and treat Diana's funeral as a "private matter." The screenplay traces the unflagging efforts of Prime Minister Tony Blair (Michael Sheen) to persuade her to publicly acknowledge the death of the People's Princess. The queen finally agrees to return to London—she'd been on holiday in Scotland when Diana died—and address the nation. In one tense scene, an aide to Blair's character calls the queen "an old bat." Blair explodes. "That woman has given her whole life in service to her people ... doing a job she never wanted. A job she watched kill her father," he exclaims. "And now we're all baying for her blood!" Elizabeth, he continues, has reigned for decades with "honor and dignity." That's my sentiment. She might seem antique—but at least, she's authentic. Since her 1953 coronation, Queen Elizabeth has been the epitome of duty, honor and grace. Something that's sadly lacking in the head of state on this side of the pond. That said, I was a bit curious about Mary Morrison who signed the letter. It turns out she's one of eight ladies in waiting—more companion and confidant than servant—to the queen. The daughter of a baron (the lowest order of British nobility), she's expected to be proficient in etiquette, languages and to read and answer correspondence. A quick Google search says other requisite skills are embroidery, painting, horse riding, caring for the royal wardrobe and discreetly passing along messages from the sovereign. The gray-haired Morrison, whose formal style is "The Honorable," made headlines a few years ago when the car she was driving was impaled on a retractable security barrier outside Windsor Castle. The barrier accidentally was raised as she crossed it. Aside from a few bruises, she escaped unscathed—but her vehicle was totaled. I'd never have known any of these obscure facts had I not written to Buckingham Palace. I could have emailed Her Majesty, I suppose, and might have received a reply. And I then could proclaim: "Hey, I got an email from the queen!" Big deal. In this digital age, a lot of folks—on the street, on the bus or on, perhaps, the toilet—seem to be glued to their smartphones and tablets. In fact, the Hacker Noon blog culled the results from more than a half-dozen studies on Americans' use of the ubiquitous electronic devices. It found the average adult spends two hours and 51 minutes daily on cell phones and tablets. In the 18-24 age demographic, the number rises sharply to four hours and five minutes daily. On average, we receive 32 texts and six calls daily. And in a lifetime, young adults will spend five years and four months talking, texting and tweeting. The study also points out that our love affair with mobile devices isn't necessarily addictive behavior. Rather, it's evidence of a "massive cultural shift" in how we stay in touch with one another. But it's my contention that, amid the bits and bytes of the digital revolution, there still remains a place for good old-fashioned letter-writing, whether the missive is to a friend, a politician, a celebrity or a monarch. I'd suggest, maybe, that you pick up a notepad, uncap a pen and find an envelope. Try writing a letter, or even a 34-cent postcard. It might seem quaint. It might not be cool. But you just might be surprised by the result.